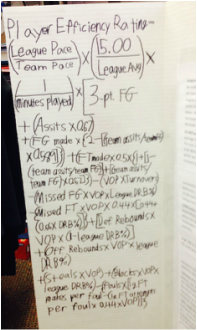 Editor's Note: Harris W. ('16) uses mathematics to comprehend the meaning behind basketball player statistics. Brandan Wright has the third highest true shooting percentage in the league, which is very good, but when it comes to the box score, that’s really all he does. He only averages 4.1 rebounds per game, which is 39th out of 59 total centers in the NBA. So the reason for his high PER is that because it is a per minute statistic, these numbers are inflated by that lack of minutes that he plays. Projecting his statistics per 36 minutes, he has some of the more impressive numbers in the NBA, however, there are reasons that he can’t play 36 minutes a game, while a player such as Lebron James can play 36.3 minutes a game. Wright’s lack of a varied offensively skill set makes it difficult to do too much of offense, which can be detrimental to a team throughout the flow of a game. Something else that he does on a frequent basis is foul. When a player is constantly fouling the other team, he needs to be kept on the bench for a longer period of time than a player that won’t foul because he is more likely to foul out of the game, and the other team gets to take foul shots, which players make at a higher frequency than any other shot, except for layups. All this being said the highest PERs in history do belong to some of the greatest players. The top three are Michael Jordan, Lebron James, and Shaquille O’Neal, three surefire hall of fame players.